Lucca, Italy, 23rd September 2017: The Struts, fronted by Luke Spillers who is surely the love child of Freddie Mercury and Ian Astbury, have done an excellent job of keeping us entertained for thirty minutes and have just left the stage. And then it begins; Woo-woo…woo-woo…woo-woo…woo-woo. A whisper that soon becomes a roar. Like 55,000 owls, we hoot in the dark, feathers quivering with anticipation. At 21.12 we are rewarded as Mick Jagger takes the stage. Woo-woo…woo-woo; now our nocturnal call is mixed with thunderous applause and euphoric screaming that could wake Lucifer himself as the Stones unleash Sympathy for the Devil. We are hypnotised by Jagger’s performance, which is everything it should be; dark, dangerous, flawless. 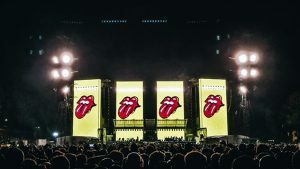 Rubber lipped and limbed, Mick Jagger struts the stuff of legend and at 74 there is no sign of his energy diminishing. It’s Only Rock n Roll (But I Like It), swiftly follows and becomes a mass singalong. There are whoops of joy for Tumbling Dice, then there’s a change of tempo as things get distinctly Bluesy for Just Your Fool; this comes with the joy of Mick Jagger’s very fine harmonica playing. Ride ‘Em Down (another cover) and Let’s Spend the Night together are perfectly executed but not personal favourites so I can breathe again. Touchingly, when we get to As Tears Go By, an unbeknownst talent emerges as Mick sings in Italian to the delight of our host country, although it seems that the distraction of performing in a foreign language leads to some timing issues…more about that later. Then we rip through You Can’t Always Get What you Want, Paint it Black and Honky Tonk Woman – all faithfully reproduced just as we know and love them. Afterwards Mick introduces the rest of the band, including backing vocalists, sax, base and keyboard players, before getting Ronnie, Charlie and Keith to reluctantly take a bow. At this point, I should say that they all look incredible. The subject of Ronnie Wood’s health has been hogging the headlines for months and despite his public battle with cancer, he looks well, energised and very lovely indeed. Keith is still the adorable rapscallion of old, and Charlie looks…well…exactly like Charlie – which is just how we like him. I’ve no idea what these guys are on, but if it could be bottled we’d all be queuing round the block for it. Jagger then disappears for ten minutes or so (for a cuppa tea, lie-down, vitamin shot – who knows) while we are treated to Keith Richards on vocals for Happy and a poignant version of Slipping Away; during the latter, he struggles a bit at each end of the register. Nobody cares – Keith is utterly loved, embraced, forgiven. When Mick bursts back onto the stage, it is for Miss You and he’s got his guitar in tow. We are invited to sing along and we do. Later, Start Me Up, Brown Sugar and Satisfaction all ramp up the energy again before a brief blackout leaves us shouting for Gimme Shelter. Our wishes are granted with a rousing encore consisting of exactly that and finally Jumping Jack Flash – the end chords of which literally explode through the night sky in a shower of glittering stardust and firecrackers. And then it is all over and it hurts. Because here’s the thing. The affection that wraps Mick Jagger, Keith Richards, Ronnie Wood and Charlie Watts like a cashmere blanket is tangible. Tonight’s capacity crowd of 55,000 people from all over the world, aged eighteen to eighty proves that. For balance, I should say that there were minor issues with timing; occasions where Keith and Ronnie’s guitars and Mick’s vocals did not marry up. But this is not The X-Factor, where hopefuls who’ll be forgotten this time next year must prove accuracy – and it couldn’t matter less. Because the Rolling Stones are still the best rock and roll band in the world. End of. I’ve just read and thoroughly enjoyed ‘The Girlfriend’ by Michelle Frances, published by Pan Macmillan. It’s a psychological thriller with the ‘thriller’ aspect ramping right up in the last third of this uncomfortable yarn. The premise is simple. Ambitious working class gold digger sets out to ensnare a wealthy husband. This seems eminently possible when Cherry, who is amply endowed with both a high functioning brain and a beautiful face, meets Trustafarian Daniel, a young Doctor in waiting whom she encounters while working in a Kensington estate agency. Blown away by his new girlfriend’s good looks and air of mystery (Cherry is frugal with information about her background), Daniel takes her home to meet his high net worth parents. Almost immediately, Cherry locks antlers with Laura, Daniel’s sleek and urbane mother. There’s nothing new about the rivalry that exists between mothers and potential daughters in-law, but what is so gripping about Michelle Frances’ debut novel is just how ruthless both women are prepared to be. In terms of characterisation this is a double edged sword; on one hand, it certainly ups the ante as seeing each woman’s perspective is equally tense. But on the other, the reader doesn’t know who to root for. There are some gob-smacking plot surprises. The story takes a dramatic turn at the halfway mark and this is where readers could find their empathy switching at regular intervals. There are inconsistencies; I was frustrated by Daniel, who is presumably intelligent as he’s a newly qualified Doctor, and yet he isn’t savvy enough to see the skulduggery going on around him. Overall, all the characters are well drawn and the descriptions of affluent West London are authentic. I also enjoyed the subplots concerning Laura’s grisly dead-in-the-water marriage to Howard, and Cherry’s devoted and well-meaning mum Wendy. To say anything further about this book would be plot-spoiling, so that’s it from me. I give The Girlfriend Five Stars.